We offer Guests a comfortable & spacious accommodation option at a prime location. All Adore Apartments are self-catering and are fully equipped with oven/cooktop, microwave, fridge/freezer, washing machine, clothes-dryer, secure parking with a superb outdoor pool area as well as BBQ facilities. If you prefer not to have a full Kitchen or Laundry then relax and enjoy our stylish newly appointed Studio Apartment. Some apartments have dishwasher and/or coffee machine facilities. Set in a marvellous position we overlook vast green parklands, a popular children's playground and the re-invigorated Mildura Riverfront Precinct. 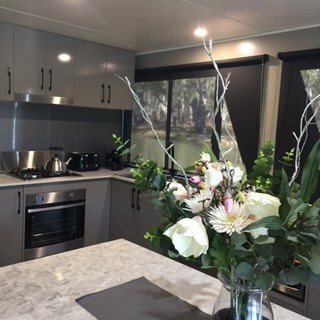 We are also conveniently located across the road from two (2) Lawn Bowling Clubs, up the road from the local Rowing Club and at the top of the rise from the Mildura Lawn Tennis Club. Relax amongst our truly fabulous surroundings, soak up the Mildura sunshine or take advantage of Mildura's Lifestyle Amenities such as the Static Exercise Equipment featured along the magnificent waterfront. 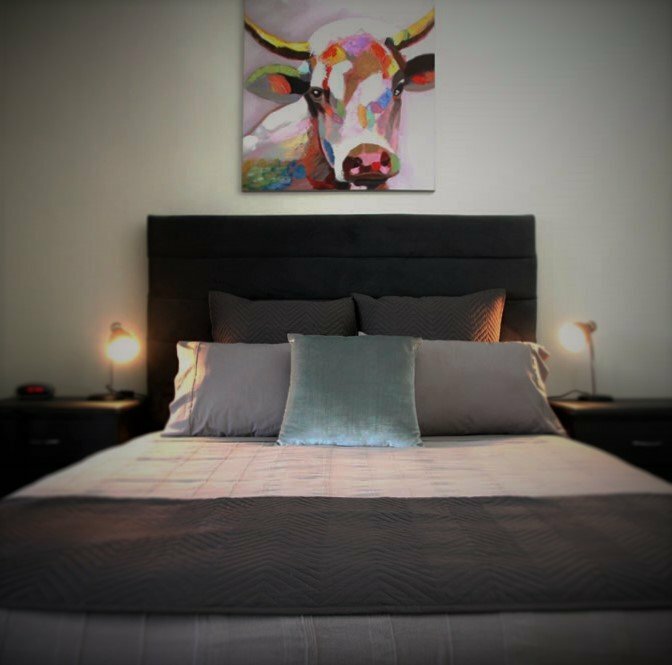 Adore Apartments are the ideal location for a romantic escape, an adventure packed family getaway and offer short or long term accommodation options to suit business and leisure travellers. 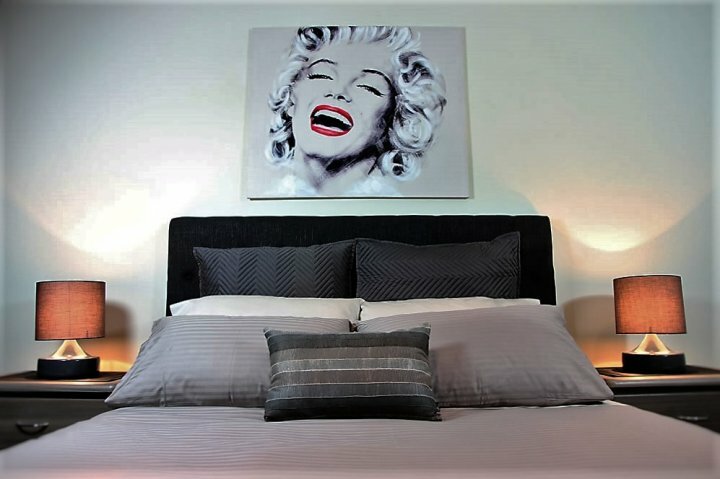 We can offer you our Adore "Sassy" or "Kooky" 2 Bedroom Apartments, our newest addition Adore "Posh" Studio Apartment or choose our Adore "House Apartment as the 2 Bedroom - 1 Bathroom Option, Or the 3 Bedroom - 1 Bathroom Option, Or the 5 Bedroom, 2 Bathroom Super-sized option may be exactly what you are looking for. Bedding arrangement being Bed 1 1x King Zip/Split OR 2x Single Bed 2 2x Single Bed 3 1x Queen, 1x L/Single Bed 4 1x Queen Bed 5 1x L/Single 3 night minimum stay. Guests included 10x Guests using existing bedding. Maximum Guest Occupancy 10x Guests (extra charges apply). Bedding arrangement being Bed 1 1x King Zip/Split OR 2x Single Bed 2 2x Single Bed 3 1x Queen, 1x L/Single Bed 4 1x Queen Bed 5 1x L/Single 4 night minimum stay. Guests included 10x Guests using existing bedding. Maximum Guest Occupancy 10x Guests (extra charges apply). Bedding arrangement being Bed 1- 1x Queen Bed 2- 1x King OR 2x Single Charge is per night based on a 2 night minimum stay. Guests included Nightly Rate includes 2x Guests using 1x queen bed. Upgrade Option 2x Guests using 1x King Bed is charged at an extra $10.00 per night. Maximum Guest Occupancy 4x Guests (extra charges apply). Bedding arrangement being Bed 1- 1x Queen Bed 2- 1x King OR 2x Single Charge is per night based on a 4 night minimum stay. Guests included Nightly Rate includes 2x Guests using 1x queen bed. Upgrade Option 2x Guests using 1x King Bed is charged at an extra $10.00 per night. Maximum Guest Occupancy 4x Guests (extra charges apply). Bedding arrangement being Bed 1- 1x King Charge is per night based on a 1 night minimum stay. Guests included 2x Guests using existing bedding. Maximum Guest Occupancy 2x Guests. Bedding arrangement being Bed 1- 1x King Charge is per night based on a 2 night minimum stay. Guests included 2x Guests using existing bedding. Maximum Guest Occupancy 2x Guests. This Apartment is not suitable for Infants/Children. Bedding arrangement being Bed 1- 1x King Charge is per night based on a 3 night minimum stay. Guests included 2x Guests using existing bedding. Maximum Guest Occupancy 2x Guests. This Apartment is not suitable for Infants/Children. Bedding arrangement being Bed 1- 1x King Charge is per night based on a 4 night minimum stay. Guests included 2x Guests using existing bedding. Maximum Guest Occupancy 2x Guests. This Apartment is not suitable for Infants/Children. Bedding arrangement being Bed 1- 1x Queen Bed 2- 2x Single Charge is per night based on a 2 night minimum stay. Guests included Nightly Rate includes 2x Guests using 1x queen bed. Upgrade Option 2x Guests using 1x King Bed is charged at an extra $10.00 per night. Maximum Guest Occupancy 4x Guests (extra charges apply). Bedding arrangement being Bed 1- 1x Queen Bed 2- 2x Single Charge is per night based on a 3 night minimum stay. Guests included Nightly Rate includes 2x Guests using 1x queen bed. Maximum Guest Occupancy 4x Guests (extra charges apply). Bedding arrangement being Bed 1- 1x Queen Bed 2- 2x Single Charge is per night based on a 4 night minimum stay. Guests included Nightly Rate includes 2x Guests using 1x queen bed. Maximum Guest Occupancy 4x Guests (extra charges apply). Check-In is from 3pm and needs to be pre-arranged by the Guest with Adore Apartments at the time of booking. Please advise Adore Apartments of your expected time of arrival no less than 24 hrs before the day of your Check-In. On the day of your Check-In, please make contact with Adore Apartments on phone 0400 011 211 when you are at least 1 hour from arriving at the property. Adore Apartments require 1 hour notice to enable us suitable time to organise your Meet & Greet & Key distribution. We look forward to welcoming you at Adore Apartments, Mildura. Limited Secured & On-Site Car Parking is Available. Please advise of your requirements at time of booking. Travel along Deakin Avenue towards the Murray River. From Deakin Avenue turn left into Seventh Street, travel approx. 786m, turn right onto Chaffey Avenue then turn right onto Cureton Avenue. You will find 169 Adore Apartments on your right hand side located at 169 Cureton Avenue, Mildura. OR select the Scenic Route Travel along Deakin Avenue towards the Murray River. From Deakin Avenue turn right into Seventh Street (Sturt Highway), then turn left at Hugh King Drive, stay immediate left while travelling along Hugh King Drive. Turn left into Cureton Avenue. 169 Adore Apartments are situated to your left hand side at the top of the Parklands.